Amber Kimball spends her days in the sun, helping her adult amateur clients unravel the mysteries of dressage. Her favorite wardrobe accessories are hay and those little green goobers you get from horse kisses. Amber and her husband, Brian, own Southern Lights Dressage located near Ocala, FL. Together, they keep an eccentric Dutch warmblood, a Clydesdale trained to third-level, and a house full of furry pets. Although, a Dachshund affectionately named Weenie is actually in charge, although don’t tell them. 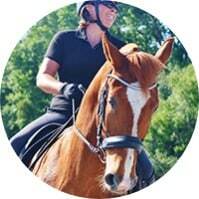 Amber trains dressage horses of all breeds and encourages riders from various disciplines to add dressage basics to their training regimens. Finally, big things are happening at Southern Lights Dressage this year. Amber looks forward to revealing the latest and invites you to come along on her adventure!